The sales industry is full of buzzwords, but unlike many that have faded over the past few years, account-based marketing has only become more relevant. In part, it’s due to the fact that we now have better data and personalization tools to understand the buyer journey and make this approach work. Another is that many account-based marketing (ABM) software tools and earliest adopters, like Marketo, are now reaping the benefits of this approach. Gartner recently predicted ABM will become the standard selling framework for most tech companies making more than $5 million in annual revenue. In short, ABM is much more than a buzzword, and we’ve got a simple framework for determining whether or not it’s the right approach for your business. Account based marketing (ABM) is a targeting strategy where companies market to accounts (different people at one company) versus individual users. ABM strategies allow companies to use an integrated approach between sales and marketing to identify, target and close accounts they value the most. A common analogy applied to account-based goes like this: in a traditional selling or marketing scenario, you cast a wide net. The market is broad and you catch lots of little fishes. With account-based marketing, you use a spear. Marketing and sales teams are completely aligned on select company targets, typically high-value accounts, and work closely together to create a hyper-personalized experience with relevant content and targeted outreach, typically through email, live chat and phone. 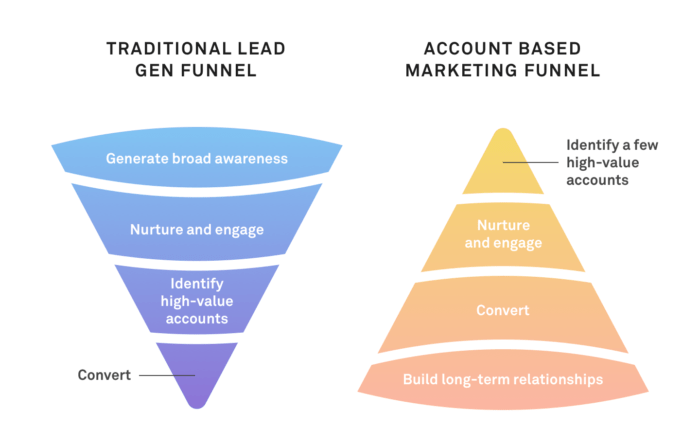 In short, the account-based model flips the traditional sales funnel. Instead of going wide and shallow, your efforts are narrow and in-depth. Often the two approaches work in tandem. Focus. Low-value prospects are filtered out in favor of leads that can yield the most value. Defined roles for marketing and sales. Because you need to establish deeper, sustained and more personalized engagement with valued customers, b2b marketers are incentivized to build truly relevant, personalized content and experiences for prospects. Meanwhile, sales needs to be more empathetic and less traditionally “sales-y” throughout the entire sales cycle. Collaboration. No other selling strategy makes sales and marketing departments become closer, better coordinated, and more unified. Efficient. Since this is a hyper-focused strategy, ABM campaigns have a reputation of reaping the highest ROI and cost efficiency among sales strategies, ie. you don’t waste resources engaging with low-value prospects. Builds long-term relationships. ABM aims to nurture clients throughout the sales cycle by providing hyper-personalized and highly relevant experiences designed to build trust. Because customers trust your brand, they are more likely to be amenable to upsells and cross-sells. Is ABM right for you? Considering the level of effort and investment needed to move into an account-based sales approach, it may be worth starting with a small experiment. Test a rhythm and cadence for one target account first before trying to scale and target multiple accounts at once. Conduct thorough research and involve cross-functional leaders to identify the customer profiles that will generate the most value for your startup. Study your target account thoroughly until you have an accurate picture of their pain points, goals and desires. To get the ball rolling fast, brainstorm a wish-list of target customer accounts that match your ideal customer profile, and then narrow it down from there. For each target account, identify the key decision makers involved in making a purchase decision, and learn everything you can about them (in a professional way). What are their pain points? What trends affect their careers? What information would help them do their jobs better? I also research each influencer’s professional background to determine if a personal connection can be drawn. Build relevant, personalized and compelling content, resources and experiences for target stakeholders. For example, you might write an industry-specific white paper with unique best practices. It doesn’t necessarily have to be a super in-depth research document either; a well written, thought-provoking, hyper-relevant blog post can get the job done too. Unlike traditional inbound marketing efforts, these are much more targeted to your known audience. Engage targets diligently across the sales cycle. Quality matters more than quantity here, as your goal is to build relationships. For instance, send relevant, helpful information rather than transactional, spammy sales messages. One very underrated approach is lightly engaging the target stakeholders on social media long before you play your way up to make a formal introduction. Regularly measure your progress based on the metrics you have set, and think about iterating on your processes at least once a week. Don’t be discouraged if you don’t see success right away. ABM focuses on quality and precision, rather than volume and scale. A|B test your outreach cadences, messaging voice, content types and channel activities frequently. ABM programs are extremely efficient, but it’s not for the faint-hearted. It requires a lot of organizational leadership to deploy entire teams over multiple channels and to build long-term relationships within each valued account. It can certainly shake up more traditional sales and marketing teams that favor a siloed approach, but as I mentioned, it’s recommended to start small and fine-tune a process from there.